Imagine you are baking a cake. You use the same ingredients that you always use, and boom, cake. But now, imagine your surprise when you discover you can make the exact same cake—an identical cake—but with a whole new set of ingredients. That’s kind of what happened in the world of physics recently. Except rather than a cake, it was the “top” quark, the biggest of the six different flavors of quarks. And instead of cake ingredients, it was protons slamming against entire lead nuclei (the center of lead atoms) at the Large Hadron Collider in Geneva, Switzerland. It’s cool. “This first measurement paves the way for further detailed investigations of top-quark production in nuclear interactions,” the authors write in the study, published this week in Physical Review Letters. So, we and everything else are made of atoms, and atoms are made of protons and neutrons. Protons and neutrons are made of quarks. Everything you see in your day-to-day life uses only the two lightest quarks, called the “up” and the “down.” There are four others which only appear in our high energy physics experiments or in exotic places in the universe. The heaviest of these is the relatively enormous top quark. The top quark is heavier than some entire atoms. It’s a good particle. “I mean, it’s called the top,” said astrophysicist Chanda Prescod Weinstein, whose undergraduate academic advisor Melissa Franklin helped discover the particle. Physicists have known about this massive quark for a long time. Makoto Kobayashi and Toshihide Maskawa first theorized it in 1973, but it wasn’t until 1995 that two teams of physicists at Fermilab in Illinois spotted it in data from the Tevatron particle collider. The Tevatron slammed protons against antiprotons at nearly light speed. Once they collide (and thanks to Einstein’s E=mc2) the leftovers turn into top quarks, linked up to their antiparticle, the antitop, since the laws of physics say that quarks can’t appear on their own. Those tops then decay into more common particles that the two teams’ detectors were able to detect. 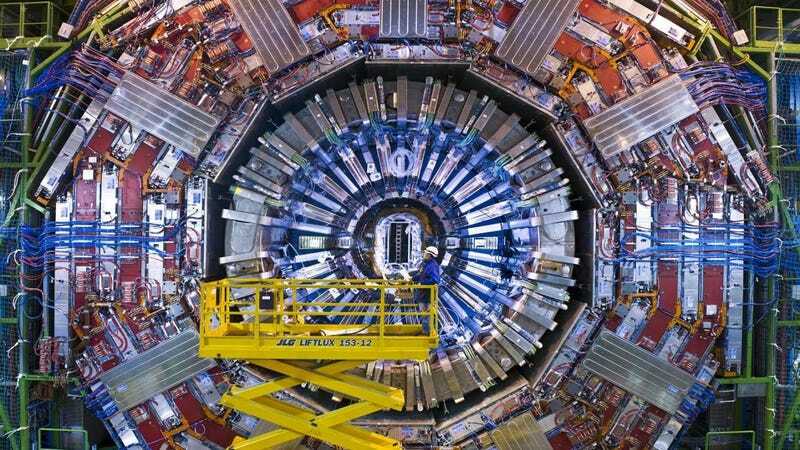 This time around, the physicists at the Compact Muon Solenoid experiment at the Large Hadron Collider used a whole different kind of process: protons colliding against entire lead nuclei. The search required looking for a very specific decay signature, sort of like detecting there was dry ice in a sealed off room by noticing an increase of carbon dioxide. This might seem like a small difference, but an entirely different type of physicists study these collisions involving nuclei, and might use the top quark for completely unrelated reasons. They will more likely use the particle to help them understand how quarks and the force particles that hold them together, “gluons,” arrange themselves in the atomic nucleus. Dennis Perepelitsa, a researcher at another experiment on the LHC called ATLAS, said, “It’s very nice to see a fundamental particle we’ve not seen in heavy ion collisions,” ones involving these lead nuclei. But he pointed out that it’s unclear whether there will be a physics payoff for this discovery, where it might actually help researchers better understand the universe. That will require more data, he said. It’s always about more data in physics, after all.